#WinningAtTwinning: DeepVeer Do It Again And All We Can Think Is Pink! Deepika Padukone and Ranveer Singh have been the only two people on our mind lately! The adorable duo was just spotted returning to Mumbai after their grand reception in Bengaluru last night. They tied the knot at Lake Como in Italy on the 14th and 15th of November. And if there's anything we've noticed through the entire DeepVeer wedding, it's that the two have been twinning and definitely winning over our hearts! And they really do seem to be full of love, those smiles are proof! Here's a picture of them dressed in Sabyasachi from earlier today when they arrived at the Mumbai airport! Aren't they a treat for sore eyes? Uff, I'm blushing! 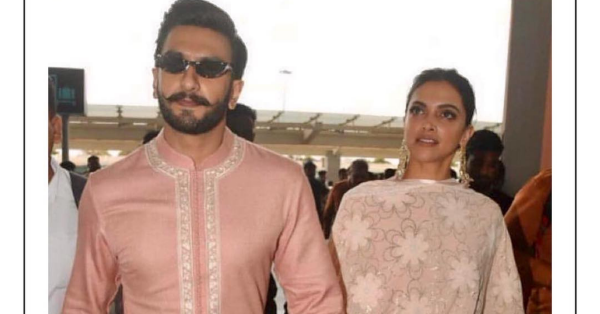 Ever since she became Mrs Singh, Deepika's airport looks have been pretty aspirational. In fact, the entire Bhavnani family was spotted looking dapper. Boys, Baba has just shown you the way to our hearts! The next time you want to earn some extra brownie points, you know what to do! Stay tuned for a lot more updates on DeepVeer!